Senior Congress leader and cabinet ministers Vidya Stokes and Sujan Singh Pathania slammed former Chief Minister Prem Kumar Dhumal for his statement and asked him to explain the “public interest” behind making the HPCA a company from a society and raising an association by the name of Himalayan Players Cricket Association and registering it in Kanpur. Earlier, Prem Kumar Dhumal has issued a statement and defended the allotment of land at various places to the Himachal Pradesh Cricket Association (HPCA), headed by his son Anurag Thakur, and termed it as an action taken in “public interest”. 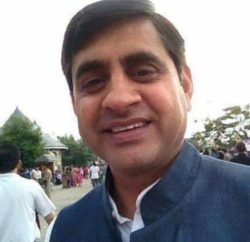 In their joint statement, the Congress leaders alleged that it was only the personal interest of his son that Dhumal served while making the allotment of land to the HPCA, the only cricket association in the country which was running a five-star hotel. Congress leaders alleged that Dhumal had used the BJP and the HPCA to establish his son politically. They further added that there was no transparency in HPCA’s functioning. It had another body with the same acronym HPCA (Himalayan Players Cricket Association) and its address was found to be fictitious, which amounted to fraud and cheating. 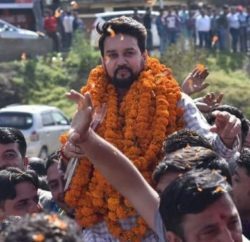 To keep absolute control over the association, Anurag Thakur had replaced the constitution of the HPCA and inducted 26 life members with voting rights in the association, Congress leaders added. They alleged that he was trying to pose himself as a victim before people to gain their sympathy. They said Chief Minister Virbhadra Singh did not believe in politics of vendetta and made it clear that investigation against the HPCA was being carried on the orders of the court on a complaint filed by an advocate. 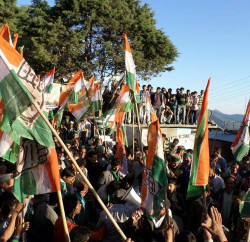 They further said it was strange that the BJP regime could not find land for Central University at Dharamsala, but there was no shortage of land when it came to obliging the HPCA.